From Spry Fox, creators of the acclaimed (and cloned) Triple Town, comes a multiplayer strategy game so ingenious and accessible that you should probably just stop reading this and go play it. Of course that would require me telling you what it is first, so you're stuck with me unless you quickly scan, and I've peppered the article with land mines. Maybe you should just read. Highgrounds is a collectible card game without cards. 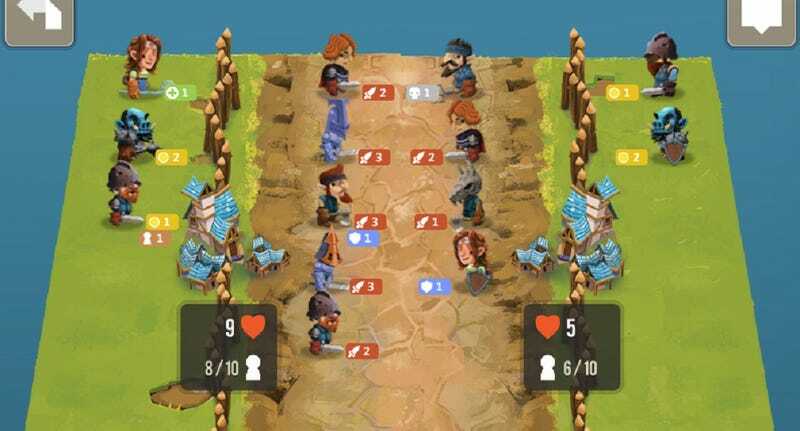 Players gather resources from their bases each turn, which are spent on placing a random selection of units from their deck of soldiers, assassins and healers onto the battlefield in one of two columns—attack and defense. Take a look at Abban here. He costs three gold to play (the base only generates two per turn, and they don't carry over). Placing him in the defensive column generates one additional gold per turn and adds an additional recruit to the random selection each round. In the front lines e generates two attack points. At the end of each turn the two armies' attack points are tallied and compared, the larger number inflicting damage on the base of the smaller. When one base is reduced to zero that player loses. So where do you place Abban? It all depends on your strategy. Are you building up resources to bring out costlier units down the line, taking a few hits in the process, or are you running an endless swarm of smaller units, pecking your opponent to death? It's crazy the different turns battle can take for such a small and simple game, especially when you stray from the non-player character battles and wade into asynchronous multiplayer. Humans can be incredibly crafty when you let them. Highgrounds is completely free to play in your web browser, with booster packs of units and gold purchasable via in-game store. Having witnessed the awesome power of some of the more rare units first hand, I say leave the unit buying to the professionals.